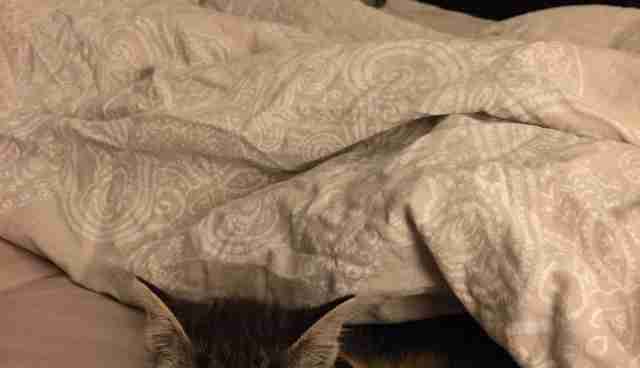 Cats can be total jerks sometimes, even to each other - and Pony, Tia, Evy and Kittay are no exceptions. 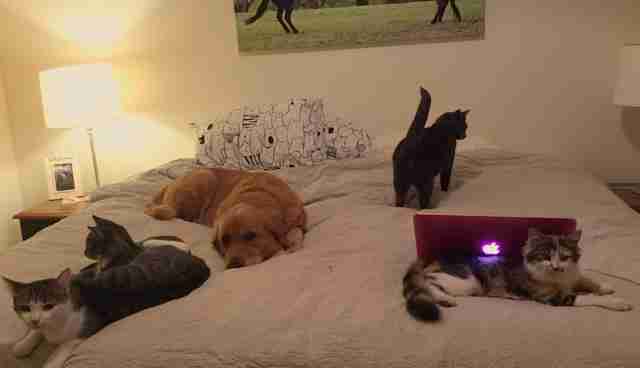 These four cats get along OK, or at least tolerate each other. But when a fluffy kitten named Dave showed up in their house, they didn't want anything to do with him ... and they made sure he knew it. Kelly Dinham, the cofounder of Freedom Hill Sanctuary, an animal haven in South Australia, found Dave and two of his brothers in an old shed on the property. A feral cat must have wandered into the shed and given birth to her kittens there. Dinham managed to trap the mother cat to spay her, but the mother didn't stick around to raise her babies. 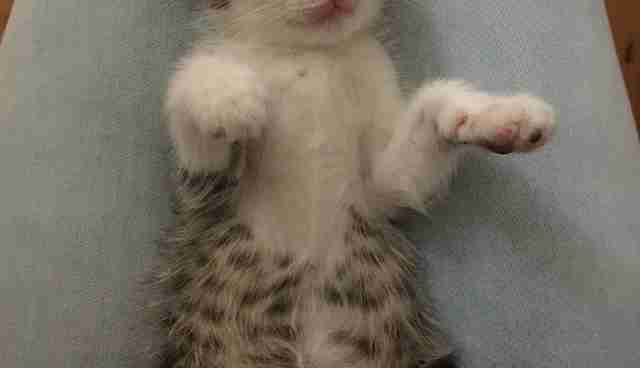 Dinham's own mother, Kym, took two of the kittens, Ed and Aiden, home with her. Dinham decided to take Dave as he was the smallest, and she knew he needed extra care. Dinham's other cats weren't impressed with the new arrival. 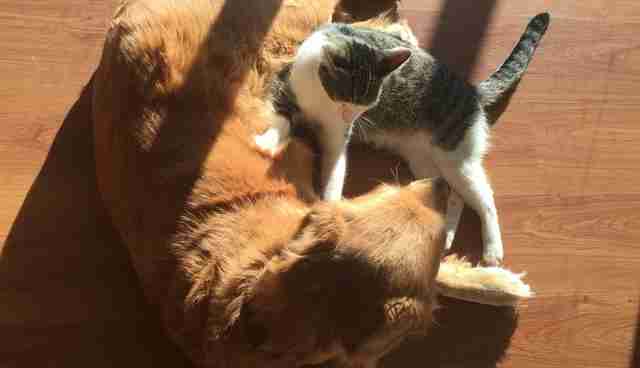 "The other cats were all older and just found Dave to be annoying," Kelly Dinham tells The Dodo. "They didn't want to play and just generally ignored him. They'd also hiss if Dave got close." 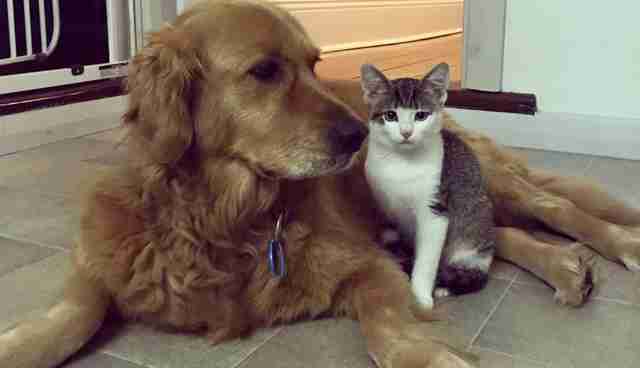 The tiny kitten might have been rejected by his new family, but Dave found an unlikely friend in Dinham's 6-year-old golden retriever, Sookie. 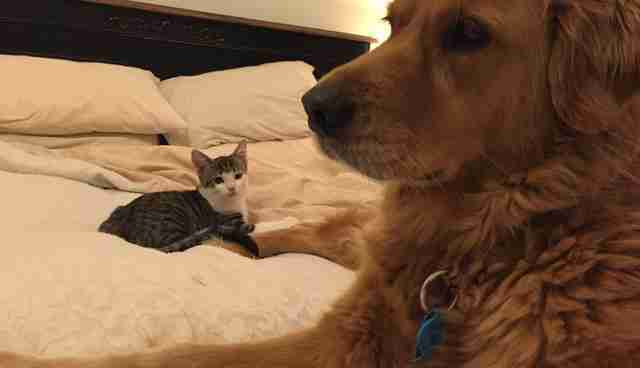 Sookie had been sleeping on the bed when Dave jumped up to meet her for the first time. 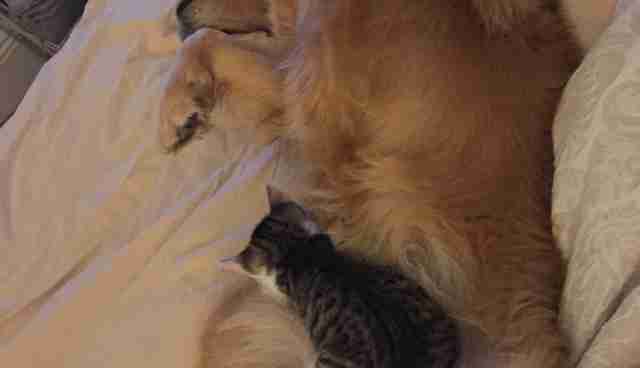 For a tiny 6-week-old kitten, a fully grown golden retriever might have been intimidating. But Dave just started playing with Sookie's tail and biting her paws as if she were a giant catnip toy. Sookie was a little annoyed at first, but she grew to love Dave. 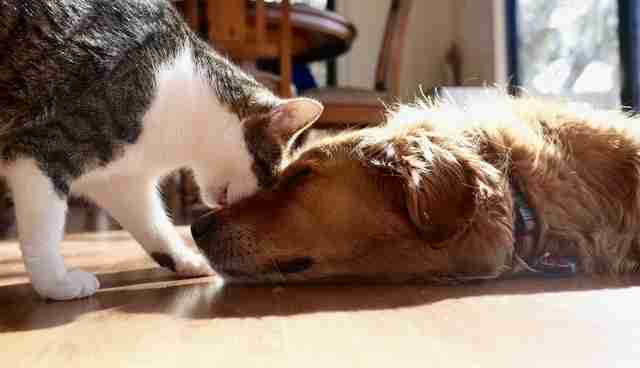 "Sookie was gentle and patient when Dave was a kitten, playing with him or cuddling him while he slept," says Dinham. "Sookie has always looked out for Dave and been a loving mother figure." 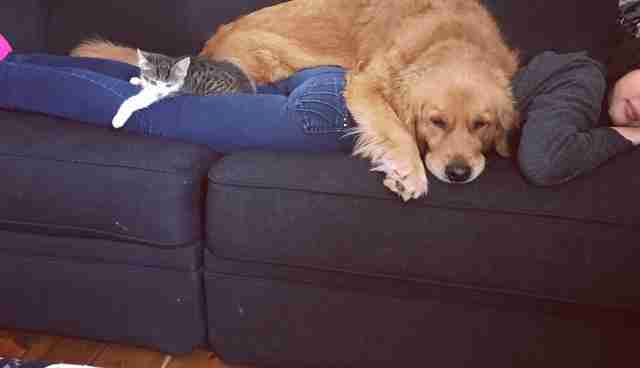 ... even when there's no more room on the couch. But Dave still likes to play with Sookie's tail and paws. "Sookie is someone Dave can always rely on," says Dinham. "It makes me so happy to see them enjoying life together. They have such an incredible bond." Dave and Sookie might have formed a close friendship, but Pony, Tia, Evy and Kittay couldn't care less. They still don't like Dave. 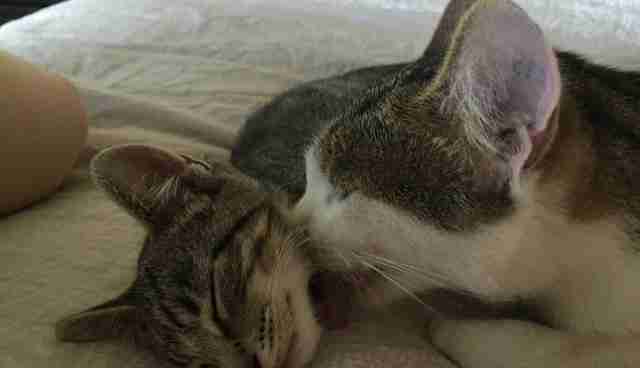 When Dinham rescued two more kittens, Mangoes and Tickles, Dave finally got some feline friends. 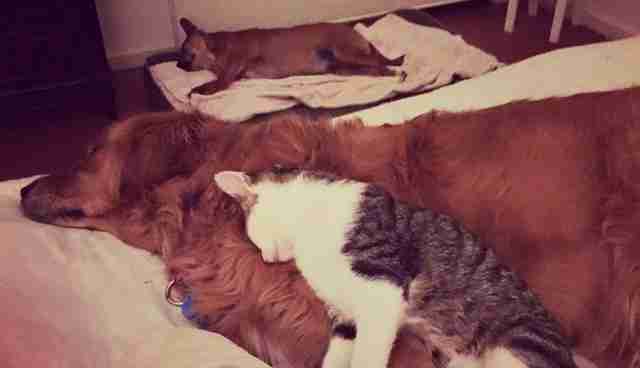 "He adores his new kitten friends, but Sookie will always hold a special place in his heart." 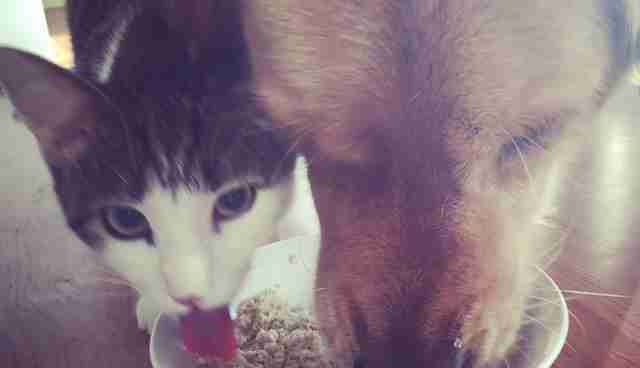 You can follow Sookie and Dave's adventures on their Facebook page. 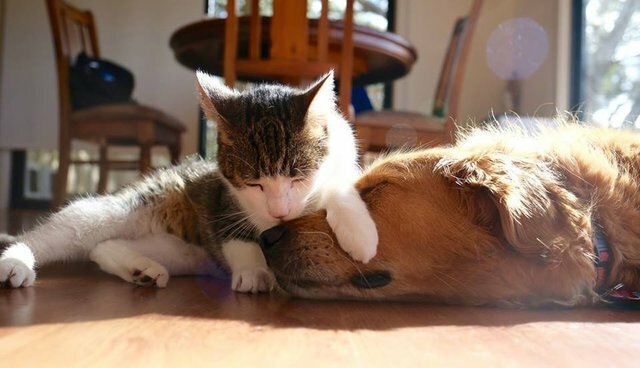 When Dinham isn't adding to her rescued cat collection, she runs Freedom Hill Sanctuary, an animal haven in South Australia, as well as Everything Vegan Online.